Test Your Knowledge:Before starting your strategic planning, let’s answer a few questions to see where you are. Download the Strategic Planning Kit Materials: Kits are PDF documents that you can print or save to your computer. In addition to walking you through all the learning material, they make great reference documents for you, your board, and your staff. 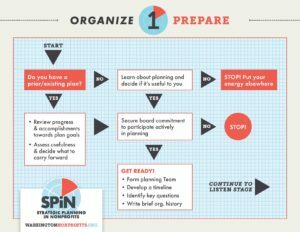 Download the SPiN Toolkit (38 pages, PDF) to guide you through your strategic planning.